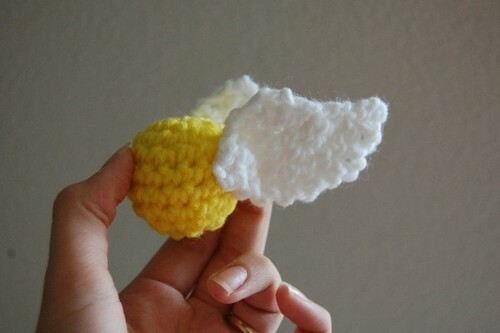 The Golden Snitch. I’ve written up the pattern and stuck it on my site: you can find it here. I’ve also been working on moving over those last few pesky patterns from my blog, but I’m really tired of doing that right now. So I hope you like the snitch, everybody! Those little suckers are fast. Ooo..those would be really cool mounted eskimo yo-yo style….!!! How cute!! And very timely!! I just Stumbled on your web site and I am IMPRESSED! Your patterns are fantastic! I hope to be purchasing one or more soon. I think I need to make a bunch of these. When I saw your snitch, I thought know this is a really Harry Potter fan. It’s aweseome! So, have you read Book 7? I still need to buy it but can’t seem to find a copy in the city. Grrr, we were visiting my in-laws for a month and were kinda cut off from the real world when the book came out. Oh well. Perfect! I know a few kids that would love for me to make them one! Thanks for the pattern! Thanks for the great Pattern. I received a Golden Snitch as part of a Harry Potter Scarf Exchange and I was delighted. My partner guided me here. Thanks for giving all of us something for our inner child.